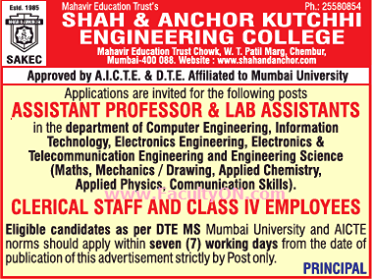 Shah and Anchor Kutchhi Engineering College, Mumbai has advertised in THE TIMES OF INDIA newspaper for the recruitment of Assistant Professor jobs vacancies. Interested and eligible job aspirants are requested to apply with in 7 days. Check out further more details below. About College: Shah and Anchor Kutchhi Engineering College was established in 1984 for the purpose of imparting quality technical education. The college is managed by Mahavir Education Trust. It offers under graduate and post graduate courses in several branches of engineering and a post graduate course in Management Studies.